If you talk about charcoal, it's commonly made by using hardwood used in the deep mountain sites with big furnace. This time, a small part of bamboo branch will be used instead for charcoal making. 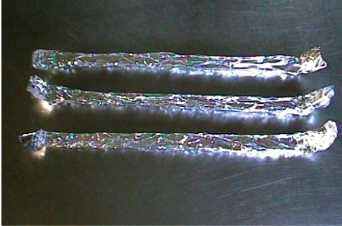 Wrap the small bamboo branches with aluminum foil as seen below. 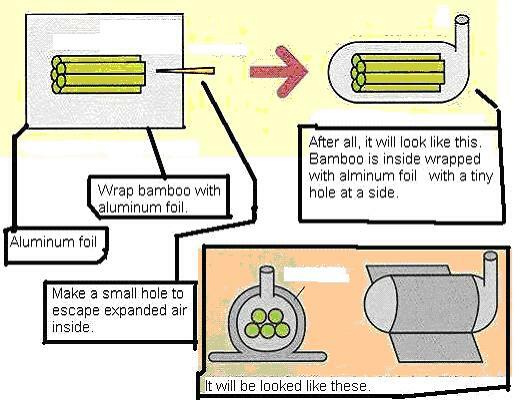 Probably, wrap the bamboo several times with aluminum foil to seal and protect it (air intact). You can use an ice pick to make a tiny hole to the wrapped aluminum foil, to prevent it from bursting when the trapped air in it is expanded by the heat. Place a wire mesh on top of the spirit lamp and position the aluminum-wrapped bamboo on top of it. 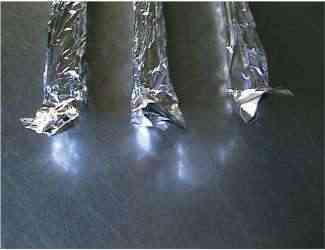 Light up the lamp, this is done to dry the bamboo inside the foil. White smoke will come out from the tiny hole, and will turn to yellow. This might produce an unpleasant smell, so you will need to open your windows or do it outdoors. When the color of aluminum foil turns yellow, it means the job is done. The yellowish color is caused by the bamboo tar. 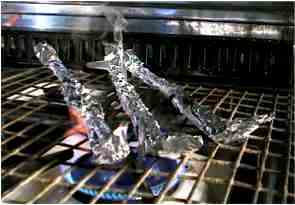 Do not open the aluminum foil until it's cooled. Heat can break the charcoal easily. 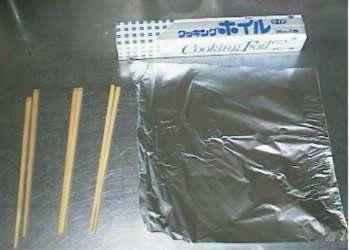 Prepare an aluminum foil and a few bamboo sticks (I used bamboo chopsticks). 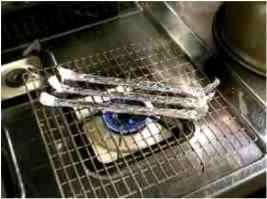 Bamboo sticks, aluminum foil, wire mesh, and stove are the only thing you need. 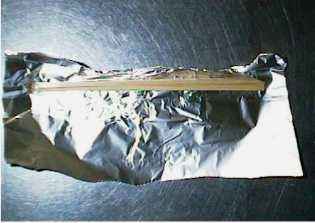 Wrap the bamboo sticks with aluminum foil. Make sure the wrapping has no holes. At the end of the wrapping, make a small hole. This is to let the accumulated gas to escape and not to blast. Place the wire mesh on the gas stove. Place the bamboo sticks on top of it. First, put up a small and weak flame. Soon, white steam-like gases will come out. 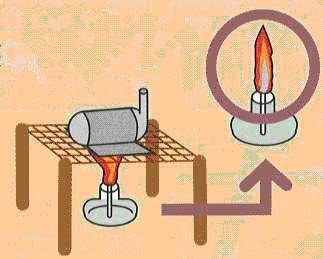 Increase the flame after few minutes (steam will turn bluish). If it turns into a whitish smoke, then turn off the gas stove. 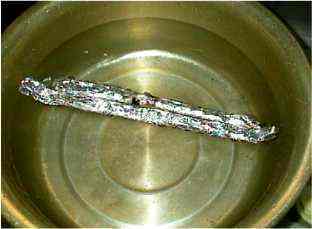 Sink the aluminum foil into a water basin for few minutes. Now, open the aluminum foil and you'll see hard bamboo charcoals. Hard and good charcoals do not make your hands dirty black. Soft charcoals are caused by oxygen present during processing. These are poor charcoals and we can't use them for our purposes. Bamboo carbonization can be divided into four stages according to temperature and products situation in a kiln. First stage drying: the temperature is below 120°C and the speed of carbonization is slow. Heat is used to evaporate the water in bamboo, and the chemical composition of the bamboo is still intact. Second stage precarbonization: the temperature is in the range of 120°C to 260°C and there is a distinct chemical reaction in bamboo. The unstable chemical compounds begin to decompose and carbon dioxide and carbon monoxide are released. Third stage carbonization: the temperature is in the range of 260°C to 450°C, and the bamboo is decomposed into liquid and gas products. Liquid products contain much acetic acid, methanol and bamboo tar. Flammable methane and ethylene in gas products are increasing while carbon dioxide production is reduced. Fourth stage calcinations (refining stage): the temperature is over 450°C. The bamboo becomes charcoal by providing a mass of heat, emitting the volatile substances and to enhance nonvolatile carbon. 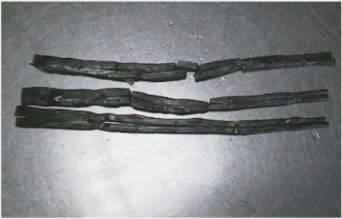 Based on the temperature in this stage, the bamboo charcoal can be divided into three groups (low-temperature, middle-temperature and high-temperature charcoal). The quality and properties of bamboo charcoal differs with different temperatures during the refining stage. Lastly the bamboo is left to cool down and depending on the weather; this process may take from five to eight days in big volume. During the above process, you can extract alcohol, tar, vinegar, medicinal liquid (water form), and many other products. Products from bamboo charcoal have countless uses - from skin diseases, allergies, influenza, heart diseases, stomachaches, insecticides, pesticides, germicides, bactericides, deodorants, disinfectants, gardening, cosmetics, cooking, washing, and hundreds of others.